Sounds like a good way to spend the summer! I don't know why theaters would take a break in the summer months, though. Seems to me it'd be easier for theater-goers to get around and get to theaters without all of the cold and dark in the way. Then again, I live in a land where it rarely snows/ices, so it could be much less of an impediment as I imagine it to be. Our theatres are mostly funded by the government/municipalities. Towns and cities give their workers a summer holiday, many municipal offices and such get closed during the summer – so theatres go on a break too. And then us Finns tend to abandon city and go to the countryside during the summer... I guess we don't want to sit inside during the few warm months of the year! There's plenty of time for indoor activities during the winter (we're indeed used to the snow). 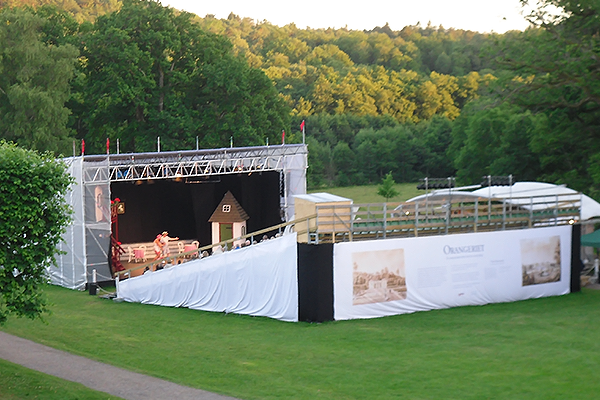 So, seasonal outdoor theatres pop up all over the country. And the outdoor theatre thing is so ingrained in our culture that even theatres that don't shut down for the summer usually take their summer plays outside.